Brasserie Blanc Oxford are taking our candlelit dinner one step further this Halloween when they transform the brasserie into a haunted house with a Tim Burton theme. 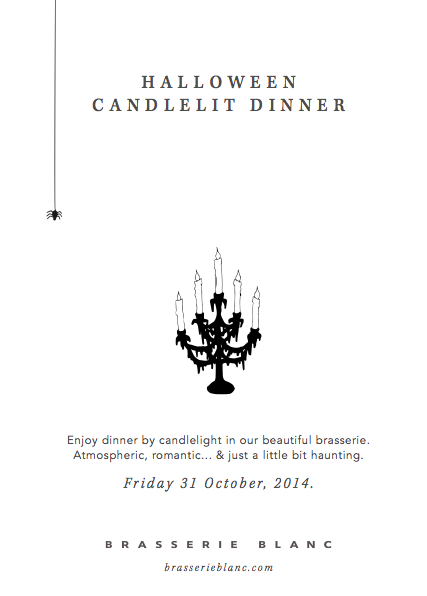 From 5.30pm onwards guests can enjoy an atmospheric candlelit evening, with scarily delicious cocktail and halloween specials. As always, fancy dress is welcome for those of you who are keen to get sartorially spooky. Booking is advised as this popular event tends to be well subscribed. If you would like to reserve a table contact Hanna & her team.